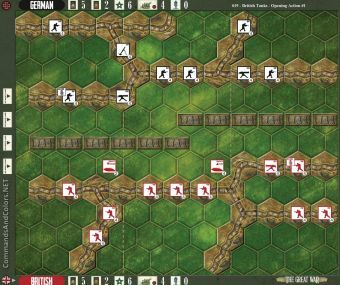 The Command and Colours - Opening Action scenarios 1 and 2 are non-historical battles, expressly designed to gradually introduce you and a friend to the basics of WWI trench warfare. 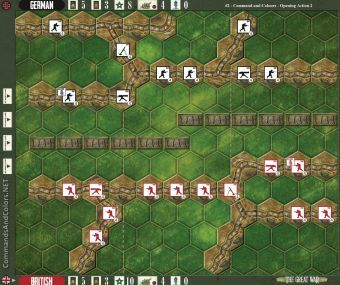 Scenario 1 features the different WWI units and trenches, while Scenario 2 adds No-Man’s-Land shelling, wire and additional victory objectives. A brief recap of the battle (usually found in this section). Scenario map, with terrain tiles, and units positioned on the battlefield. Starting Assets for each Army including: Command Cards, Combat Cards, HQ Tokens, Reserve Artillery Strength, First Player. Scenario Notes: Victory and any Special Rules. Place terrain tiles, place units, take a victory medal card, take a number 4 reserve artillery token, shuffle and deal 5 command cards, shuffle and deal 2 combat cards, take 6 HQ tokens. test message for the first scenario!